The broker has a relatively good bonus system, provides their traders with innovative and easy to use TradeSmarter platform, has a caring support team and offers slightly below average choice of assets to trade. Overall this brokers scores 80/100. The binary options industry is flooded with brokers, both good and bad. It is not an easy task to filter out the bad ones from the good ones, but if you want to be successful, it has to be done. We are here to help. In this review, we will try to honestly evaluate the good and bad sides of Finmax and try to determine whether the broker can be trusted and indeed whether you should use their services or avoid the company altogether. Finmax is quite a new broker that was founded in 2016 by a parent company Morris Processing Ltd. The company is based at 14 Tsar Osvoboditel blvd. Sofia 1000, Bulgaria and they also have an office in London. European presence is important for the company. Unfortunately, they do not have a license with any official European financial regulator. Let‘s hope they will get one soon. However, they do have a license with an independent financial authority in the Russian – Financial Market Relations Regulation Center. The broker is trying to expand their base and open more offices in Europe and across the World. The company bases their trading platform on theTradeSmarter software. Despite the fact that Finmax has only 74 assets to choose from, these are more or less equally distributed among four main categories: currencies, stocks, commodities and indices. The currency category contains 25 most traded currency pairs and their crosses. It is more or less what other brokers offer, so the number is satisfactory. In the category of stocks are 31 securities to choose from. This may seem too few, but do not forget, that most binary brokers do not concentrate on stocks, so they do not offer them at all. You will also find 6 commodities on this broker’s list. The majority of brokers will offer just 2 or 3, so 6 is quite good. Finally, there are 14 indices you can trade. The number reflects industry average. The broker could add more currencies or stocks to their list to get among the leaders in binaries in terms of assets. 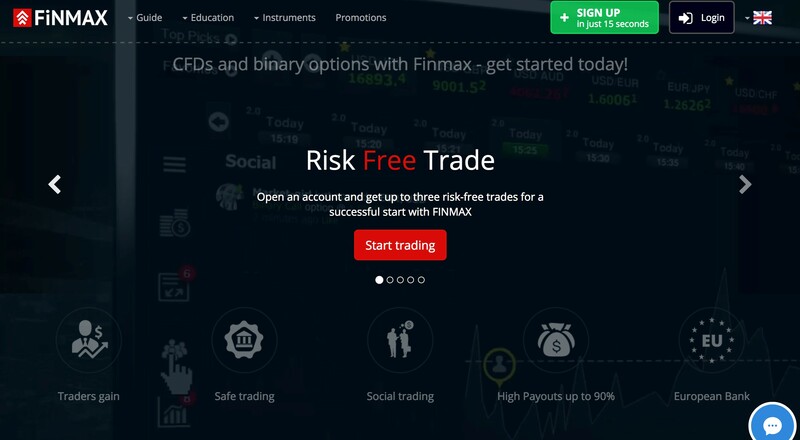 We were happy to discover that Finmax has quite a good bonus system. Every depositing trader is entitled to a risk free trade, which can get as high as $1000. You should know that this trade is only valid for your first trade if it ends out of the money. In that case, your lost money is returned back to your account. The broker also offers a deposit bonus system that is based on the type of your account. They offer 4 types of accounts for their customers. The minimum deposit for the account is $250 (up to $999). Your bonus will be 25% of your deposit amount. Silver account is yours after you deposit $1000 or more (up to $4999). Your bonus will be 50% of your deposit amount. You can claim a gold account after depositing $5000. Your bonus will be 75% of your deposit amount. This is a premium account with most benefits. Unfortunately, there is not enough information about it. You will have to contact the support team and discuss your specific needs and amount you can afford to deposit as well as terms and conditions for opening the account. 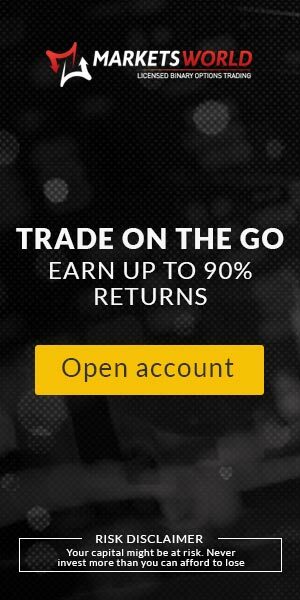 You will also be able to get 4% extra profit on your trades and 100% bonus of your deposit amount. That is one of the most spectacular offers we have seen so far! Finmax has provided everyone with the opportunity to open an account with them for as little as $250. That is the minimum deposit. It is not exceedingly low as there are lots of brokers offering $100 or even $10 minimum deposits. The minimum investment per trade is $5. It is quite good, despite the fact there are lower trade minimums with some brokers. If you are a high roller, the maximum amount per trade is $5000, which is more than most brokers will offer you. Payouts can reach 90% and this is quite good. 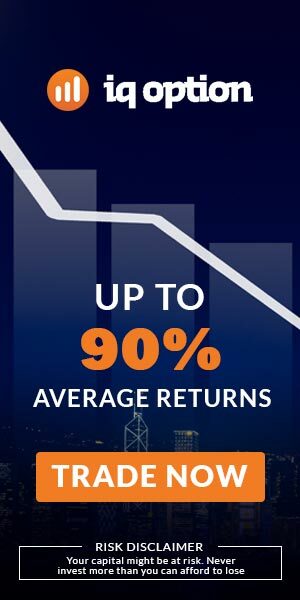 A lot of brokers offer slightly below 90% payouts. Innovative and up to date the TradeSmarter trading platform that the company offers is excellent. They state it is meant not only for making profits, but also for getting aesthetic pleasure. Going through all the functions and features that are there makes the platforms feel somewhat intuitive. You can also view TradingView charts with some of the most popular technical indicators on them. The financial news feed is also there, so you can always stay on top of all the market updates. Unfortunately, you can only trade classical High/Low and Above/Below (another version of High/Low) on the platform. A few more possibilities should be offered at some time later. Expiry times vary from 30 seconds to around a year. That is way more than you can expect with any other broker. On the whole, trading features of the platform are excellent. In terms of mobile trading, Finmax is not lagging behind from the leaders in the field as you can trade binaries on your desktop and web browser and on iOS, Windows Mobile and Android devices. Their mobile platform is identical to desktop one and you should not have any problems switching from trading on your pc to trading anywhere in the World on your mobile device. You can download app for iOS from Apple App store and for Android devices from Google Play. Finmax supports a lot of ways for depositing and withdrawing your money. You can use debit/credit cards, bank transfer (wire transfer) and a lot of the most popular e-wallets (Neteller, Qiwi Wallet, Webmoney and etc.). Minimum withdrawal is $25. In order to withdraw your money you will have to supply the support team with all the necessary documents proving your id and address before they confirm your transaction. This is done for the sake of security and in compliance of anti money laundering laws. It may take up to 5 days for your money to reach your account. However, if you have a gold or VIP account it will probably be done in one business day. Wire transfer will cost you $50, so you may choose other methods to withdraw. The broker has proven that they really care about their customers. 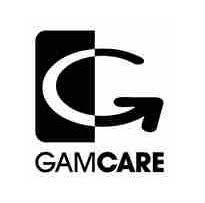 They provide live support 24/7 and the best way to contact them is on live chat, that can be found on their website. The support team responds quickly and deals with your issues efficiently. Alternatively, you can chat with them on Skype, send them an email or even call them. The fact that they support seven different languages on their website is amazing as only top brokers offer that. Before you contact them, be sure to look through the FAQ’s, as your question might already be answered there. That section could be expanded though, as there aren’t too many questions there. Other than that, customer support is excellent. The company offers a lot of extra features and resources. 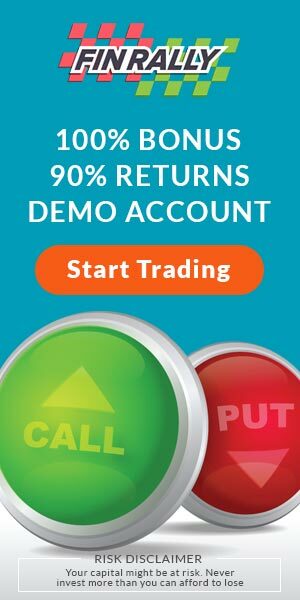 You can try a demo account for free. If you feel you need to familiarize yourself with their trading platform, it is a good opportunity to find out what is where and how things work on the platform. Test it without risking any money. 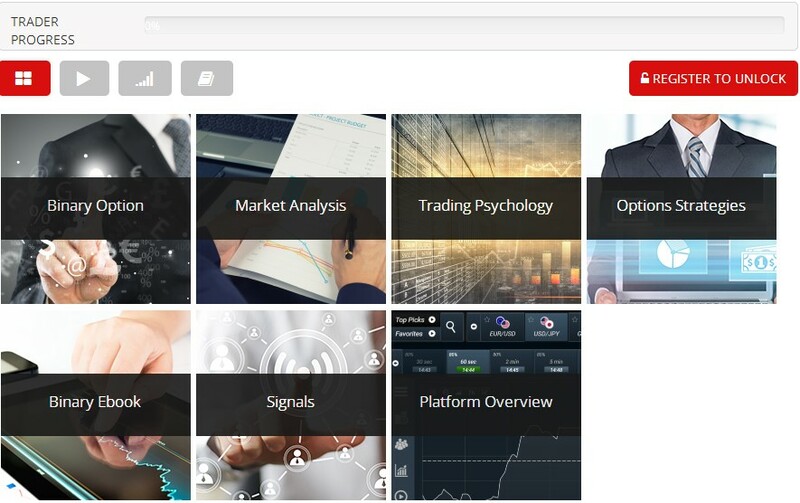 There is also an educational page on the website, where you can get lots of educational videos, listen to webinars about different aspects of trading binary options, familiarize yourself with trading strategies that are for both novice and advanced traders. If you are new to trading there is also a glossary which you may refer to for some trading vocabulary and jargon that might be new to you. Having taken into account all of the above mentioned points we can safely say that Finmax is definitively not a scam broker, but rather a reliable financial operator offering qualitative services to their customers. What is maximum amount per trade? The maximum amount is currently capped at $5000. However, you can purchase a few options with maximum amounts if you want to invest more than $5000 on a specific trade. You should contact your tax authorities as all profits are taxable according to laws of your country of residence. What are the ways of depositing? All deposit methods are indicated on the Finmax website. You can make deposits via debit/credit cards, wire transfer or e-wallets. What assets can I trade with Finmax? 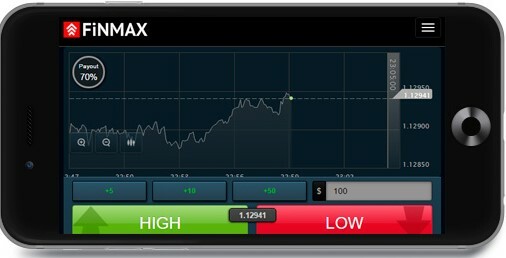 You can trade assets across four major categories: currencies, stocks, indices and commodities. Asset list can be found on the Finmax website.